L’Oasis has six bedrooms, five with king size beds and one twin room. All are air-conditioned and have en-suite bathrooms. L’Oasis also has a dining room, living room, Kitchen, Library and a covered terrace that over looks the sea. For more information on the accommodation at L’Oasis please see the side menu. 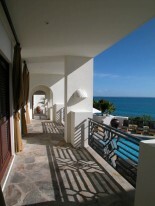 Private villa L’Oasis situated on Baie Rouge Beach on St Martin. L’Oasis is fifteen minutes from town and just ten minutes from shops. 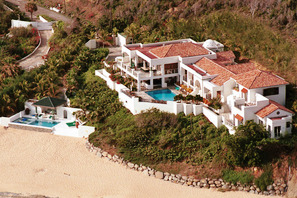 St Martin has direct flights from US and European cities and L’Oasis is just fifteen minutes by road from the airport. L’Oasis is a luxurious private villa located on St Martin Island, in the Leeward Islands of the Caribbean. 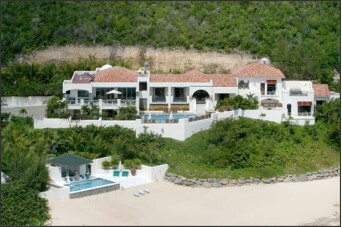 The secluded and gated five-star, beach front estate offers total privacy and is situated at the end of Baie Rouge beach. L’Oasis is equipped with everything from a private SPA and pool pavilion to a fully equipped gym and a state of the art entertainment system throughout the house. The villa has extensive decks and terraces with breathtaking views of the ocean making it the perfect getaway to entertain your family and friends. The full time chef will ensure that the gourmet kitchen is kept busy preparing you favorite dishes and snacks, which can be enjoyed while you relax in one of the properties expansive entertaining areas. L’Oasis is Moroccan styled with contemporary overtones and has a dramatic dome entry with a fountain, fully equipped media room; five king bed suits and one twin suite, as well as a gourmet kitchen. Guests can choose between a swim in one of the two private swimming pools or a dip in the ocean. 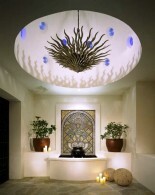 L’Oasis villa’s private beach pavilion also features a full SPA with exterior Spa Pool, two massage tables, a manicure and pedicure area and a steam room. The main pool by the house has a large deck and many sun-lounges for sun-bathing. The beach pool has a cocktail table in the shallow end so guests can sip their favorite cocktails without getting out of the pool. L’Oasis has two swimming pools and has direct access to Baie Rouge Beach. The estate also has a private SPA and a gym room including equipment such as a multi-station Universal, treadmill, an elliptical machine, free weights, and exterior Spa Pool. This exclusive property has an automatic generator, an electronic security gate, a Aquapremium alarm system and a safety deposit box to ensure guests safety. The villas communications equipment includes a satellite dish network, DVD, stereo, CD player and surround sound, telephone and fax machine and high speed internet/WIFI.